For a comfortable terminal-like interface see the ELIZA-Terminal. For a modern interface (featuring speech I/O) see E.L.I.Z.A. Talking. 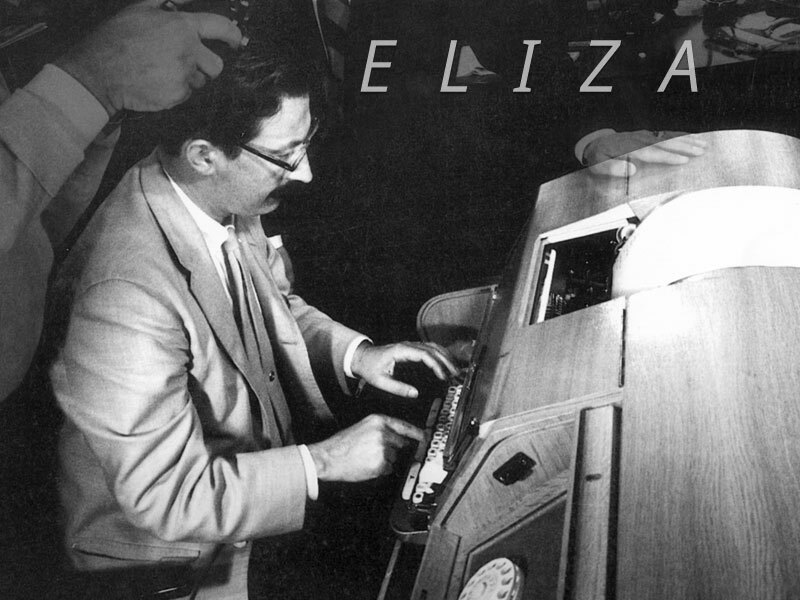 ELIZA is a natural language conversation program described by Joseph Weizenbaum in January 1966 . It features the dialog between a human user and a computer program representing a mock Rogerian psychotherapist. The original program was implemented on the IBM 7094 of the Project MAC time-sharing system at MIT and was written in MAD-SLIP. At this writing, the only serious ELIZA scripts which exist are some which cause ELIZA to respond roughly as would certain psychotherapists (Rogerians). ELIZA performs best when its human correspondent is initially instructed to "talk" to it, via the typewriter of course, just as one would to a psychiatrist. This mode of conversation was chosen because the psychiatric interview is one of the few examples of categorized dyadic natural language communication in which one of the participating pair is free to assume the pose of knowing almost nothing of the real world. If, for example, one were to tell a psychiatrist "I went for a long boat ride" and he responded "Tell me about boats", one would not assume that he knew nothing about boats, but that he had some purpose in so directing the subsequent conversation. It is important to note that this assumption is one made by the speaker. Whether it is realistic or not is an altogether separate question. In any case, it has a crucial psychological utility in that it serves the speaker to maintain his sense of being heard and understood. The speaker furher defends his impression (which even in real life may be illusory) by attributing to his conversational partner all sorts of background knowledge, insights and reasoning ability. But again, these are the speaker's contribution to the conversation. For a conversation example given by Joseph Weizenbaum in his article see the Eliza Test page. As ElizaBot is a totally self-contained object and instances use their own internal memory it's possible to have multiple instances of the ElizaBot object talking to each other. ElizaBot is also a general chatbot engine that can be supplied with any rule set. keywords with higher rank take precedence. decompositions are matched in definition order. reasemblies are chosen by random or cycled through if the no-random flag ist set. the special keyword "xnone" holds the rules for default phrases (no match). positions are any matchings of "*" or "@synon"
pres, posts, synonyms, keywords, decompositions all in lower case. all definitions are optional but at least elizaKeywords should be supplied. "I am at a loss for words.". a smoothing mechanism for any productions of a bot-to-bot conversation. Data representations and syntax follow the "canonical" form. The structure of "elizaKeywords" follows the internal data model as described by J. Weizenbaum in his article . mass:werk  media environments <http://www.masswerk.at>. "elizabot.js" is free software and provided "as is". It is distributed in the hope that it will be useful, but without any warranty; without even the implied warranty of merchantability or fitness for a particular purpose. "elizabot.js" should be compatible to most browsers with support of RegExp (that is all standard browsers). Weizenbaum, Joseph "ELIZA  A Computer Program For the Study of Natural Language Communication Between Man and Machine"
in: Communications of the ACM; Volume 9 , Issue 1 (January 1966): p 36-45.